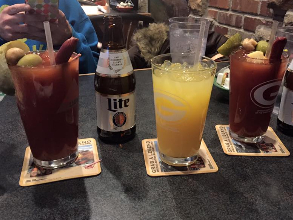 Come enjoy the BEST Bloody Mary in town! We sold 15,623 Bloody Marys in 2018 so you can be certain we're doing something right! Thanks to all of our customers for helping break yet another record!!! Wow - That's almost 1,953 gallons worth! Enter your cell phone number in the kiosk up front every time you visit and start earning today. When you watch select sporting events in the Flipside Pub we have our "Game Day" kiosk on. Just enter you number to participate and earn free stuff faster! The Area's Favorite Pub and Eatery without the Franchise! Family owned and operated since 1970, Ardie's Restaurant has been offering real homestyle cooking and satisfying the appetites of area residents for over four decades. Ardie's serves delicious Breakfasts, Lunches and Dinners seven days a week! In 2009, we remodeled one side of our restaurant and turned it into the Flipside Pub. With this remodel, we offer the best of both worlds. You can sit in a family friendly sports pub and enjoy music or a game, or you can sit in our warm and cozy dining room and have a quiet meal. Same kitchen, same owners, but offering a different dining experience! Takeout orders available. Great service and excellent boneless wings!! Outstanding food and service! Came in for 1/2 price burgers, may make it a Tuesday habit! So yummy! Food was very good. Service was also very good. Good food exactly as ordered albeit a little cold but I was in a good mood. The breakfasts at had were amazing. Everything was perfectly cooked, but the fresh baked sourdough toast apple the show. Great food, great service , great prices. As always, great service! Amazing breakfast. Came to try the burgers. Both had the BBQ bacon cheeseburger, so yummy! Will definitely be coming back! Excellent, bartender is the bomb diggity!!! Awesome. Love always coming here. Drinks were great did not have lunch. We Love Flipside! Today's is great because Cassie & Jayme are working! Great batter fried fish, cole slaw (best in La Crosse) & baked potato. We had our holiday party at Flipside. The dinner and service was exceptionally good. Chili and homemade sourdough bread toast grilled - yum. Homemade bread such a treat! Great service! Always love the bloody Mary's. I'm sorry for the loss of your mother. Love their food especially Crabby Dave. Good service too. Eat there often. A+++ Great food, specials, and service! Mary did a great job as our server. She was so much fun and very attentive. Thank you, Mary. The food was delicious and the waitress was polite and on the ball with asking if we wanted or needed anything without being a bother. We will come back again. Excellent service at the bar. Great burger happy hour on appetizers and drinks. Mary J is a nice waitress.